These adorable little bite-size Christmas puddings make an ideal Christmas treat. This Christmas Pudding biscuit recipe is the perfect treat that can be pre-prepared and frozen a month in advance – leaving you to focus on wrapping the gifts and having fun with family. 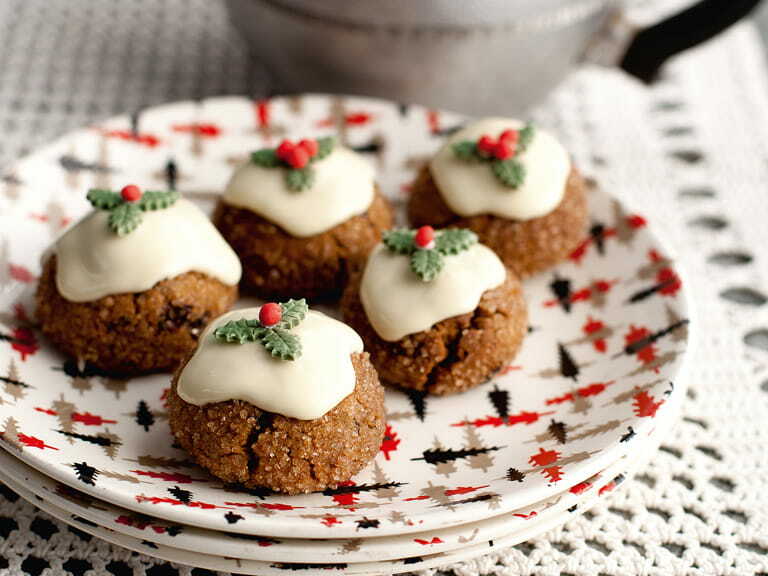 And what could be prettier and more festive at Christmas than a plate of tiny puddings? 1. Put the currants, mixed peel and raisins in a bowl with the brandy. Stir, cover with cling film and put in the fridge to steep for anything from 1 hour to a week. When you're ready to use it, strain off any remaining liquid, then finely chop the fruit or whizz in a food processor. 2. Preheat the oven to 200ºC/Mark 6 and line two baking trays with non-stick baking paper. 3. Cream the butter, sugar, vanilla and zests.Warm the treacle in the microwave for 10 seconds on High and add to the butter mixture along with the spices. Mix well to combine. 4. Roughly crush the toasted almonds with your hands and add to the butter mixture along with the flour, ground almonds and chopped fruit. Mix well to combine. 5. Roll the mixture into walnut-sized balls with your hands, then roll each ball in the demerara sugar and place on the prepared trays, spacing them at least 2 cm apart. Bake for 10-15 minutes, until the biscuits look dry and slightly cracked on the surface. Set aside to cool on their trays for about 5 minutes, then use a palette knife to transfer them to a wire rack. 6. While the biscuits are cooling, melt the chocolate, stirring regularly. Slide a sheet of greaseproof paper under the rack and spoon about a teaspoonful of chocolate onto each of the biscuits, letting it run down the sides. Allow it to set a little, but while it is still sticky, press some pretty decorations onto the top. I like to use holly sprigs made from sugar florist paste, Christmas sprinkles or finely chopped glacé cherries. Allow the chocolate to set completely before serving. Miranda Gore Browne is an ambassador for children’s charity Dreams Come True. Children’s charity Dreams Come True fulfills the dreams of children and young people with serious and life limiting conditions. Their Christmas Appeal this year aims to raise enough funds to make 12 dreams come true, one for every day of Christmas. You can find out more about each dream at www.dreamscometrue.uk.com. To donate click here or text TRUE12 £5 to 70070. 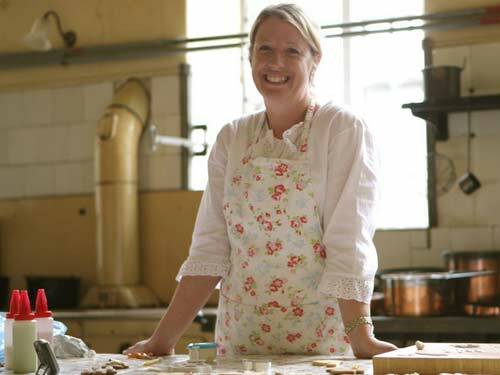 Miranda Gore Browne was a finalist in the first series of The Great British Bake Off and is a Dream Tea ambassador.